Drunk with power following the success of its amazingly not horrible breakfast menu, Taco Bell has created giant Crunch Berries filled with warm milky cream. They want you to put them in your mouth. The fantastical Foodbeast (via my pal Owen) was invited to Taco Bell's mysterious test kitchen to give these colorful creations a try, snapping some exquisite photos of gooey cream slowly oozing from the bright pink insides of what are essentially doughnut holes. In fact, these Cap'N Crunch Delights are a riff on the company's Cinnabon Delights, which are cinnamon sugar doughnut holes filled with cream, the food equivalent of biting into a warm, sugar-dusted boil. Take the Cinnabon Delights, mix in something that makes them pink, and roll them in crushed hopes and dreams Cap'n Crunch Crunch Berries cereal—not Oops, All Berries!, the perennial proof of the ineptitude of Quaker Oats' factory workers—and you've got what looks like slightly bruised testicles coated in children's breakfast cereal. 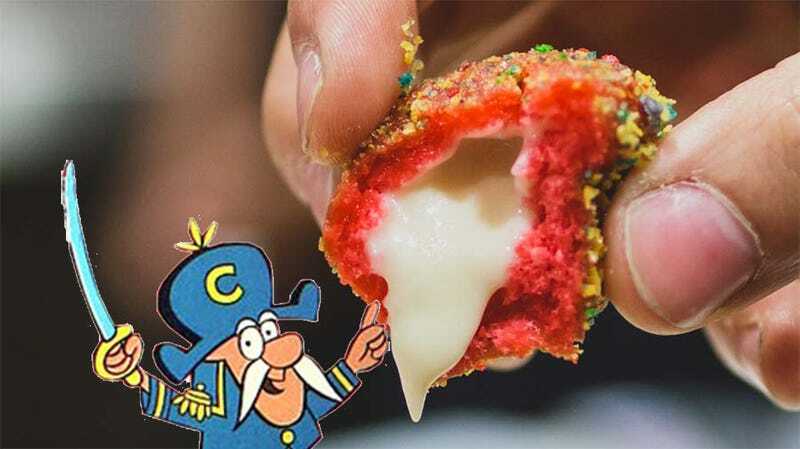 Thankfully for those of us on the East Coast or in other countries, Taco Bell is currently testing out Cap'n Crunch's "Does This Look Infected To You"s only in Bakersfield, California locations. I will not be making a road trip to try them. You can't make me. Images taken by Peter Pham of Foodbeast. Go there and be endlessly delighted.